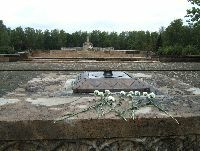 These pictures were taken during the first week of September, 2007 in Riga, Latvia. 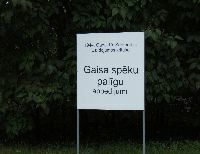 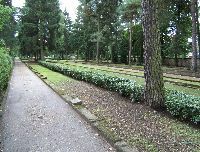 There are great photos at http://www.rigawarcemetery.com/. 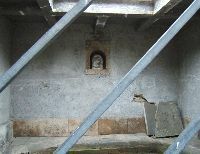 The several poor pictures at the bottom were taken in the summer of 1999. 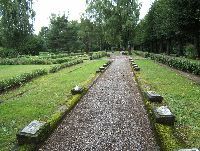 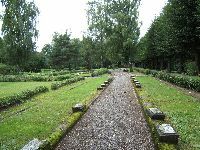 The cemetery started out as a gravesite for several dozen soldiers who died in Riga military hospitals. 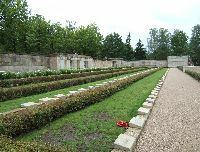 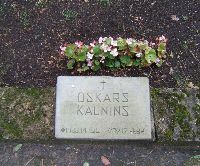 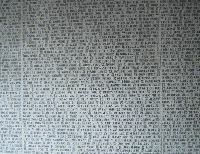 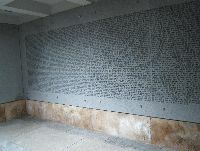 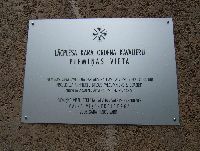 It had to be expanded several times and eventually included several thousand fallen from both the First World War and the Latvian Liberation War. 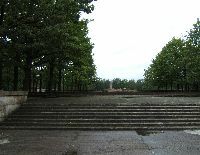 In the 1920s, it was redesigned and became a kind of "holy place" for national ceremonies. 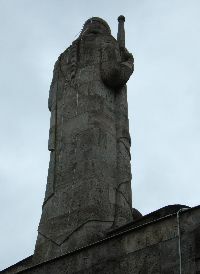 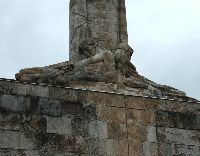 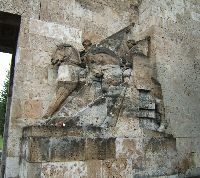 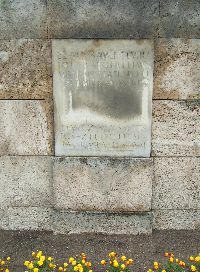 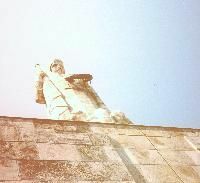 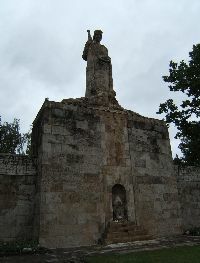 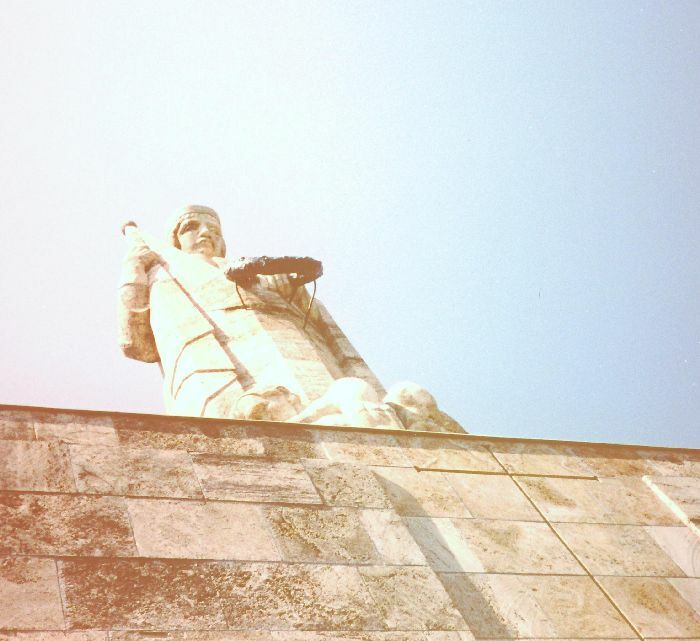 It was neglected during the Soviet period; Christian and Latvian national symbols were removed from the stonework. 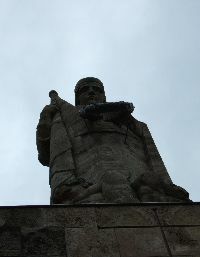 Since the reestablishment of independence, an effort has been underway to rennovate the site. 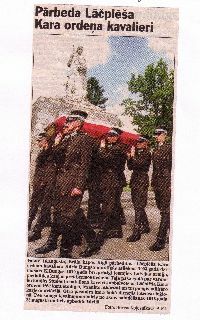 This newspaper clipping shows a picture of how the cemetery has still been used in recent times, for burying military heroes. 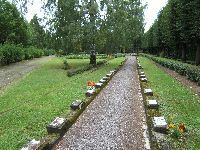 Here, Latvian soldiers dressed in the uniforms of the inter-war Latvian armed forces, carry a coffin to the Brethren Cemetery. 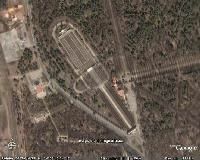 The following photos, after the satellite photo, were taken in 1999 on a poor camera and were scanned in. 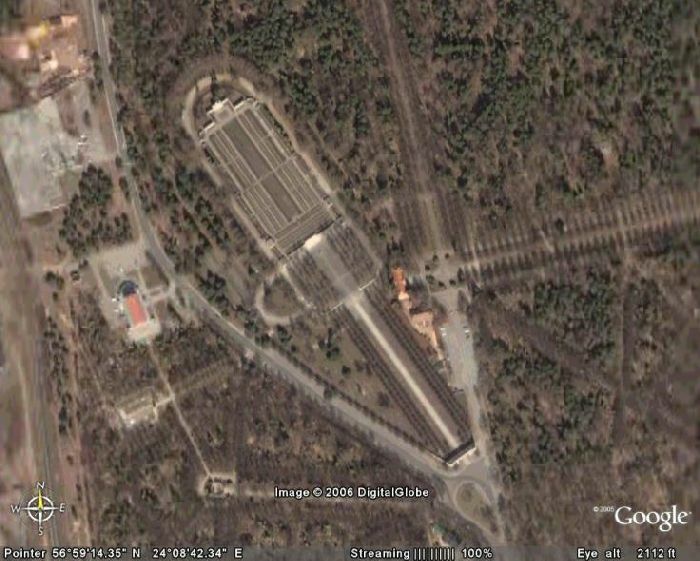 This satallite image from Google Earth shows the complex as it appears from an altitude of 2800 ft. 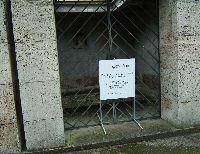 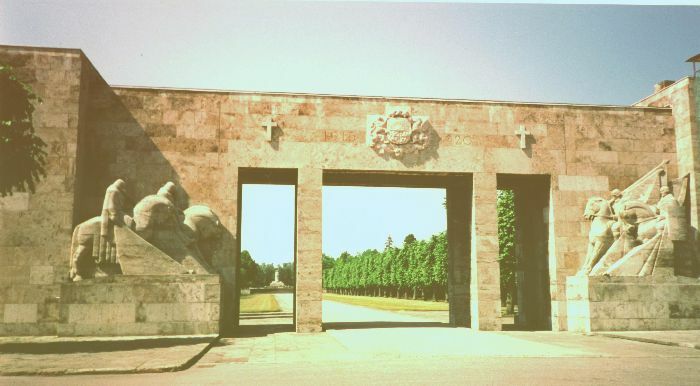 This is the main gate at the entrance to the cemetery. 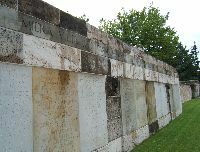 The dates 1915-1920 are interesting in their own right. 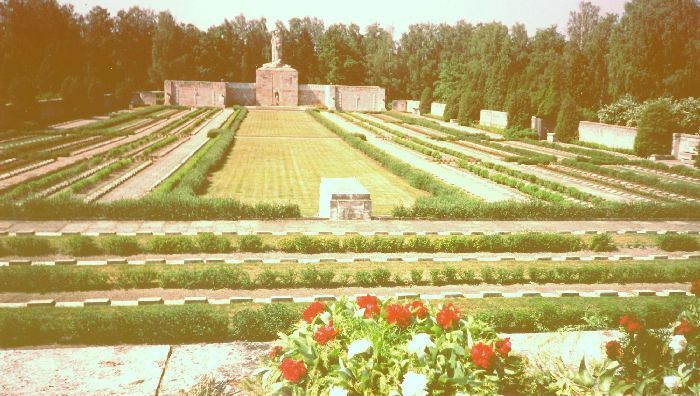 Latvians were dying in the First World War by the thousands even in 1914. 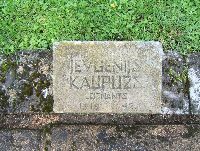 But only in 1915 were they being organized into specifically Latvian national units, albeit still as part of the Imperial Russian Army. 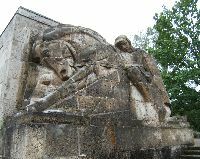 The fighting in the Baltic did not end in 1918, but continued on in a three-way war, the Latvian War of Independence, until 1920. 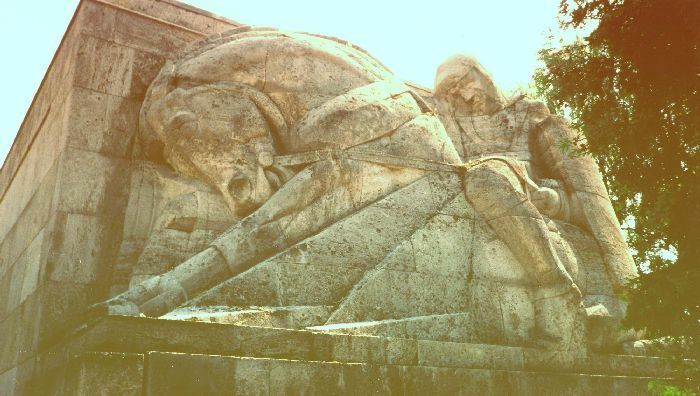 The Russian Civil War, in which Latvian units were involved, continued even after 1920. 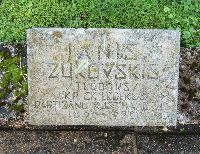 So the dates mark those years in which men died as Latvians, arguably for Latvia - not the dates in which Latvians were dying in war. 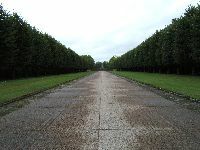 Past the gate, the visitor passes down a broad pathway. 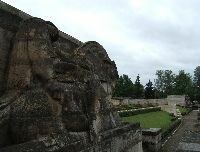 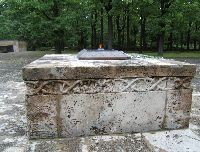 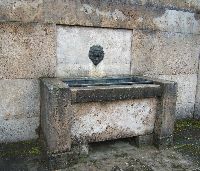 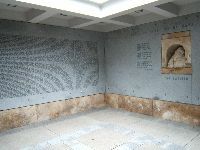 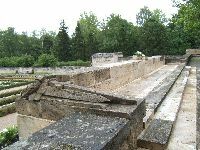 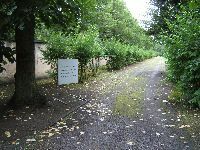 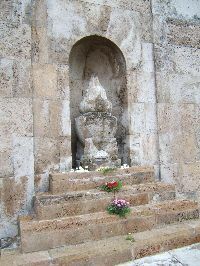 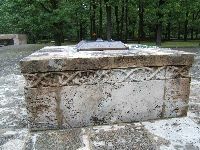 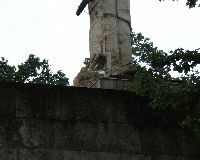 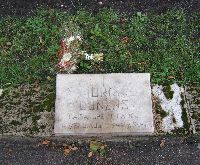 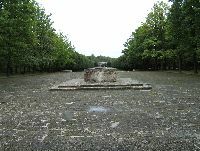 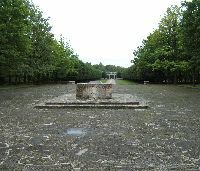 After passing through the main gate and walking down an wide alley between tall trees, visitors reach this spot, where there is an eternal flame on an altar-like stone. 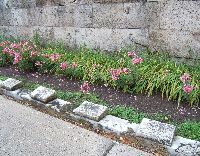 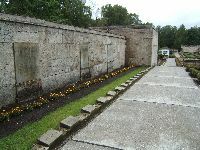 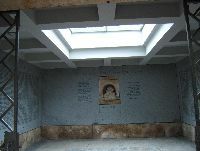 Beyond that, above the main grave field, there were flowers and wreaths on the wall the day I took these pictures. 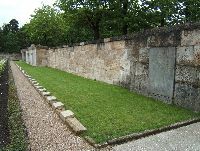 This cemetery is still very much in use for ceremonial purposes. 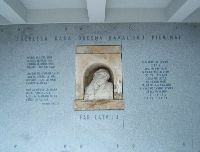 When I took these photos, I was not being very systematic, so I did not record what is written on the wreath. 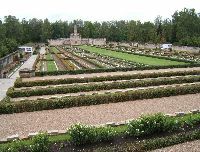 This shot is overlooking the field of graves. 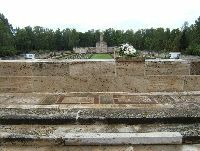 There are approximately 2000 men buried here. 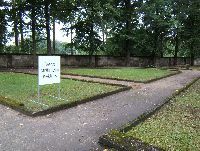 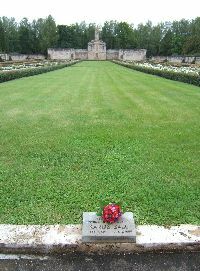 The field of graves seen from ground level. 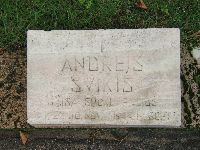 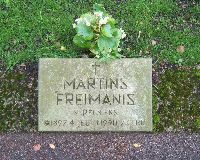 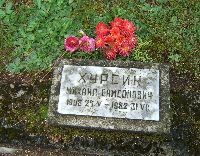 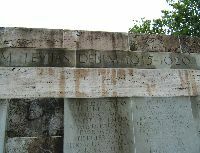 The gravestones show the name and date of death. 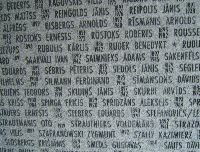 These men were killed during the Russian July offensives of 1916 as members of Latvian rifle units. 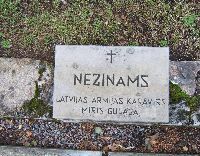 The word nezinams means, unknown. 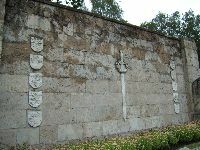 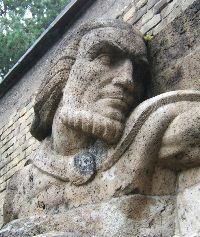 On the walls above the main grave field, the coats of arms of all of Latvia's regions are displayed. 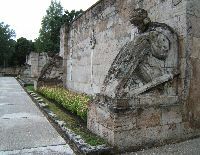 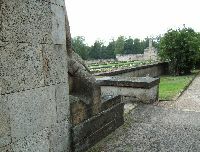 This is a side view of the ensemble at the back of the cemetery. 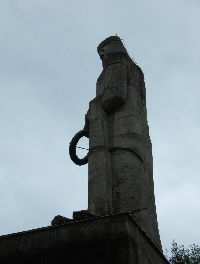 The four kneeling warriors carry the shields of the four provinces of Latvia. 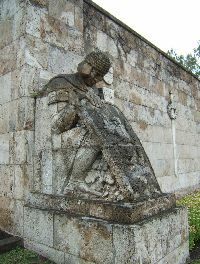 Archeological research was consulted in the 1920s to assure that the warriors' dress and arms were accurate, although some artistic license was taken. 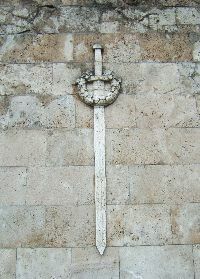 There are two of these swords mounted on the stone wall at the back of the cemetery, between the kneeling warriors. 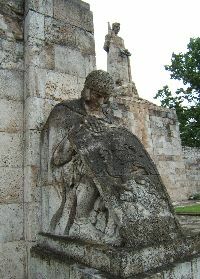 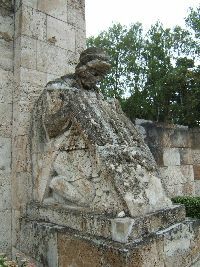 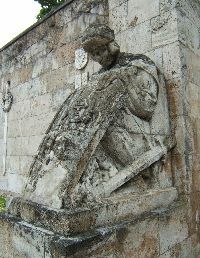 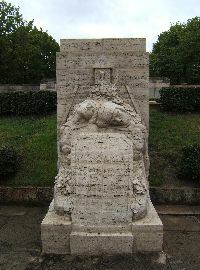 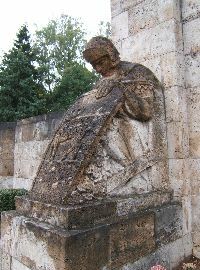 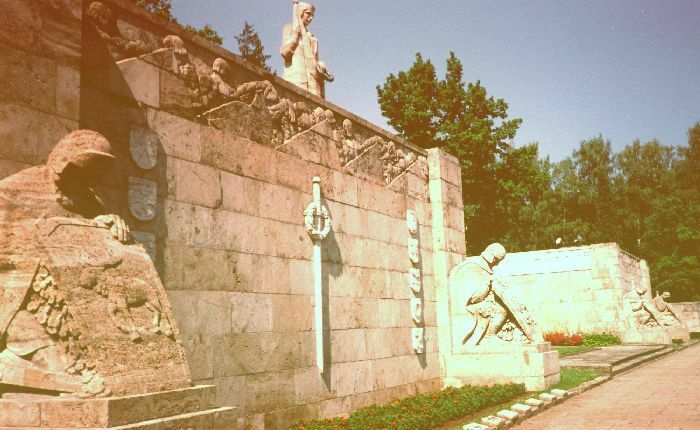 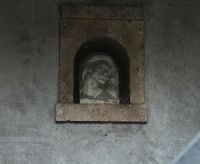 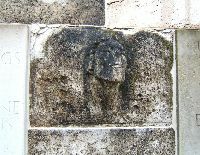 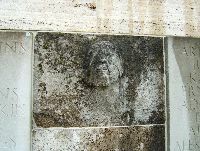 The female figure is a typical centerpiece of many war cemeteries. 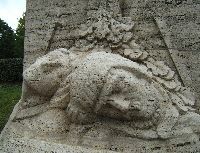 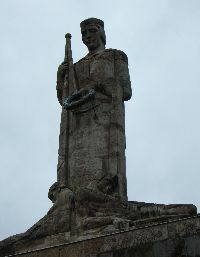 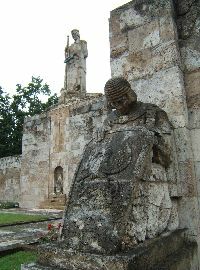 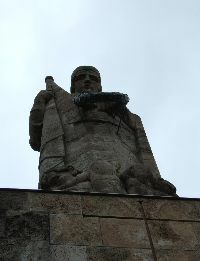 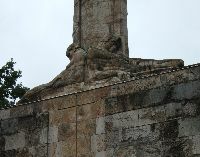 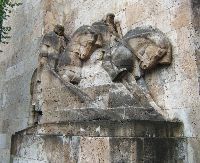 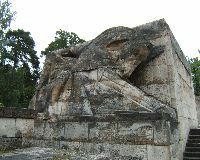 The dying or dead warriors at her feet are not visible from this angle. 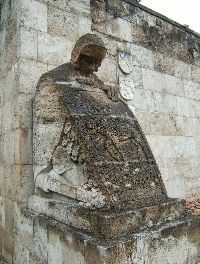 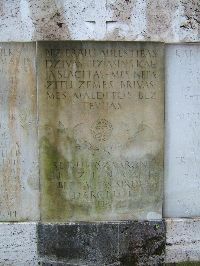 She is "Mother Latvia" and is laying a wreath with one hand, carrying a flag with the other. 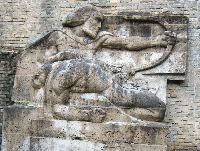 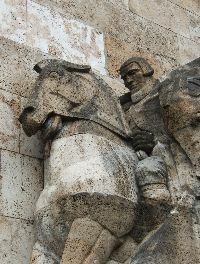 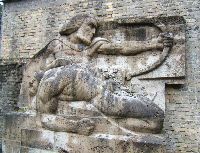 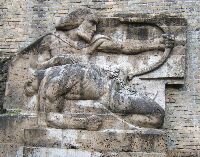 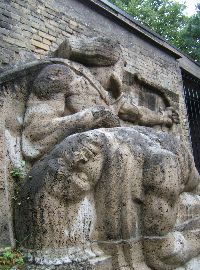 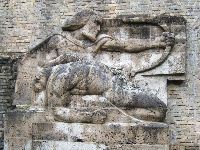 The wounded cavalryman is on one of the side walls.